As digitalization drives business at ever-faster speeds, CFOs recognize the need to keep pace. They understand the importance of financial planning and analysis (FP&A) solutions that allow their finance teams to develop budgets and forecasts quickly and accurately. They need confidence in their numbers and the decisions they drive. 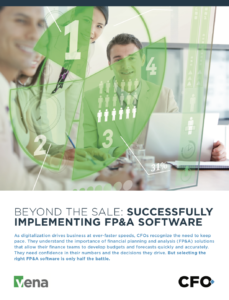 But selecting the right FP&A software is only half the battle. Download this research report on CFO’s integrating new technologies across the enterprise.